Photograph This! : There comes an iPad. Take a look! 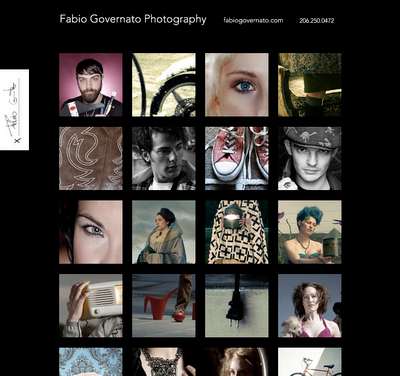 I have a new iPad ready page to show my work. Unless you have been living in a cave you probably know that photographers have been talking endlessly (and often smartly) about what the iPad will do for the industry. I got one recently, mostly to show my portfolio to clients. The iPad is certainly lighter than my printed one. I have been experimenting with different solutions, namely using iPhoto galleries and by importing the pdf version of my printed portfolio, which I can show with iBooks or GoodReader. Also, and perhaps more importantly, I want to make sure that clients and ADs will be able to see my work from their little shiny new toys in a consistent and pleasant way. My current web site is neat, but does not allow the viewer much flexibility or control. Enters my new iPad ready gallery. It is simple, has a great design, it is easy to upgrade and you can navigate by tapping on each image (and left and right on the big pop up ones). If you give it a go, let me know what you think.